There's much more to SmartDwelling I than the things I wrote about two years ago when it was published in the Wall Street Journal's Green House of the Future story. Really cool stuff is afoot with Project:SmartDwelling, so this will be the first of several new posts looking at SmartDwelling elements. The Breeze Chimney is designed to turn into the wind, like a weathervane. The open end of the Breeze Chimney is always leeward as a result. There's a phenomenon in physics known as the Venturi Effect, and it works like this: air moving past an opening tends to pull gases or liquids out of the opening. If you're old enough to remember cars before fuel injection, then it was the Venturi Effect that made the carburetors work. Breeze chimneys behave the same way. They have another thing working for them as well: the Thermal Chimney Effect. 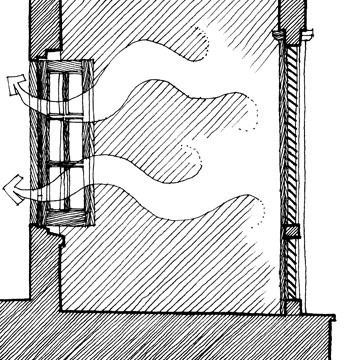 Because hot air rises when given the opportunity, hot air in a tube like a chimney flue will rise out of the tube, pulling other air in behind it from the room below. To start a breeze chimney, all you need to do is to open a window somewhere in the house. Pulling in air almost as warm as the air exhausted by the Breeze Chimney wouldn't do much good, so you need to find a window around the house or shop where the air is coolest. The best place would be under a grove of trees or big shrubs. Not only do the leaves shade the area around the window, but they also cool the air even further by giving off water vapor. It can easily be 10-15 degrees cooler under a shady grove or in a thicket. A louvered verandah like the ones found throughout the Bahamas would be good because the louvers prevent the sun from getting into the porch and warming it up. A porch on the shady side of the house would work equally well. A breeze chimney works best in late afternoon or early evening, when the air has cooled a bit from the heat of the day. Porches on the eastern side of the building would be coolest at this time of day. There's no reason you have to use the same window, however… you could experiment to see what works best for you. 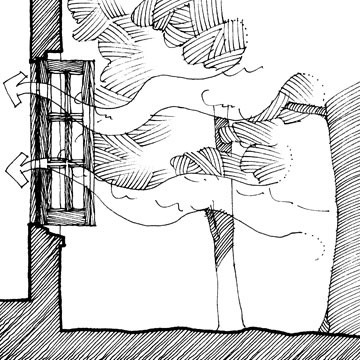 But in any case, it's the act of opening the window that starts the Breeze Chimney's operation because without replacement air pulling into the house, the Breeze Chimney can't pull air out. So think of it as an attic fan that doesn't require any electricity. What about storms? 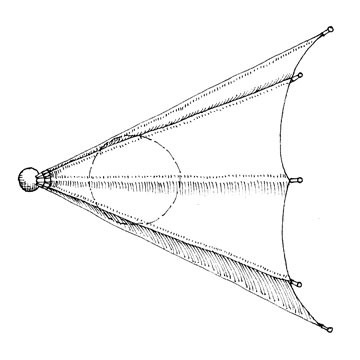 Wouldn't the sail cloth tear in high winds, flooding the house? Clearly, there needs to be some way of shutting the Breeze Chimney in a storm, or when you're going to be away from home for awhile. See the heavy black line on the right side of this drawing? It's meant to represent a spring metal arc that holds the spars up. There would be two cords coming down the chimney. Pull one of the cords, and that pulls the spring metal arc over to the left, collapsing the shroud. Pull the other one, and it pops back up. I haven't yet built a Breeze Chimney, so I'm sure it would require a bit of tinkering, but that's the general idea of how it should work. The house above was designed for a competition we never expected to win. It was intended as a critique of the Gizmo Green competition program and, just as I expected, the jurors didn't view it very kindly. I'll blog more about it later… my point of showing it here is to illustrate how differently Breeze Chimneys can be designed. 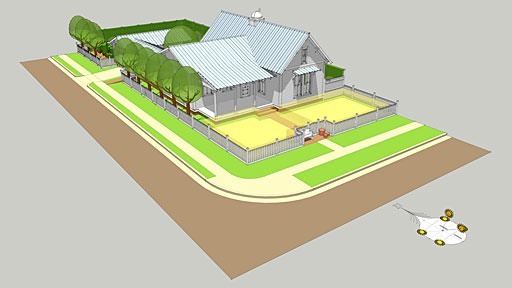 This house was designed for Dallas. A century ago, you could find pivoting sheet metal roof vents all over the Midwest and Southwest. 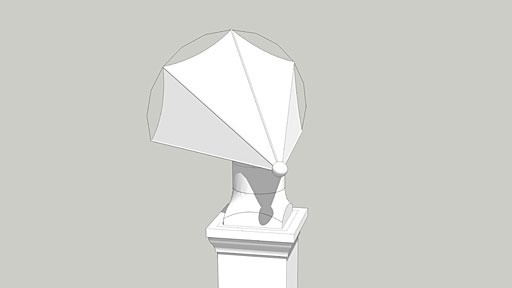 So I designed this Breeze Chimney to be built of the same material. 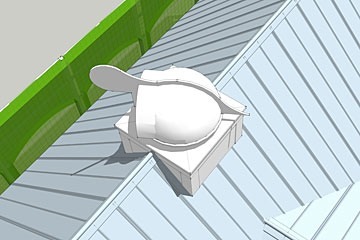 There are only two differences between this Breeze Chimney and the old pivoting roof vents. First, it's a good bit larger than the old ones so it can ventilate the whole house. Second, the old pivoting roof vents usually vented the attic. 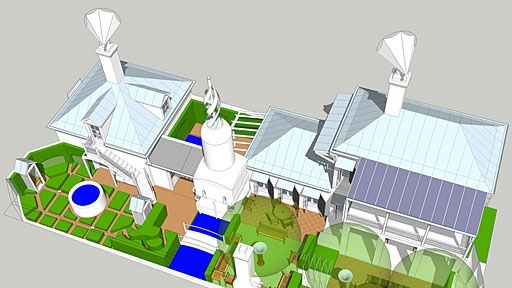 In this design, there's a chimney (concealed by the roof) that connects the cap to the living spaces below. Breeze Chimneys are one of the cool parts of SmartDwelling I that are an old idea with a new implementation. Have a look; think they'll work? None have been built yet, but I'd love to have time to tinker with them. 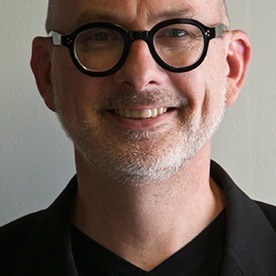 Steve, I love this idea. Thanks for sharing. Have a current project that a few breeze chimneys would serve well. Will have to do more research. Wonderful idea. I think you should mass produce these and place one in each room. The ventelation may be more important than the assumed fireplace. A fireplace and chmney is not cheep but the vortex creator and sheet metal flew could be repeated several time on a house. Point of clarification: the Venturi effect is where fluids move faster when they move from a larger volume vessel to a smaller one - i.e. why water sprays out faster when you put your finger over the end, or why wind moves faster down at street level in a city. The phenomenon described above has more to do with lift, like on the wing of an airplane. 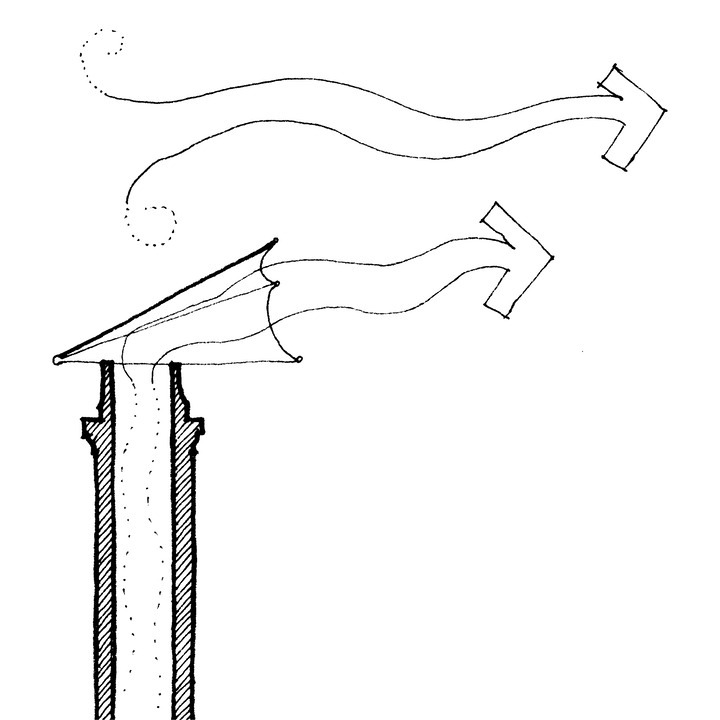 The wind passing over the breeze chimney (similar to wind catchers in the Middle East) accelerates, creating an area of low pressure at the mouth of the device. It is this low pressure area - kind of like an eddy in a stream- that draws air up through the chimney. There are other types of stack ventilators that use latent heat inside the building or even direct solar gain to create negative pressure inside the building. The chimney above requires air flow to work. Which type to use depends a great deal on climate factors as well as building volume, occupation, etc. I seem to recall on our sail boat the opening faced toward the wind and attached to the mast/yard arm/boom and drew air below. 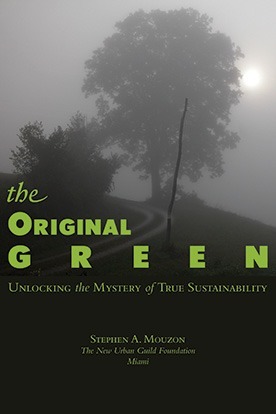 Seeing your Breeze Chimney, it occurs to me that many of the revived techniques of living homes, especially in warm climates, relates to vertical flow of energy from earth to sky. 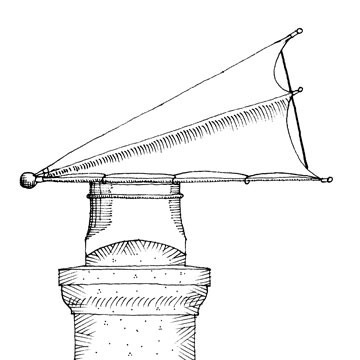 The Breeze Chimney, and the Tower of Wind and Water are conveyors of water or air from earth to heaven, and vice versa. The courtyard typology similarly is a vertical window between sky and earth.